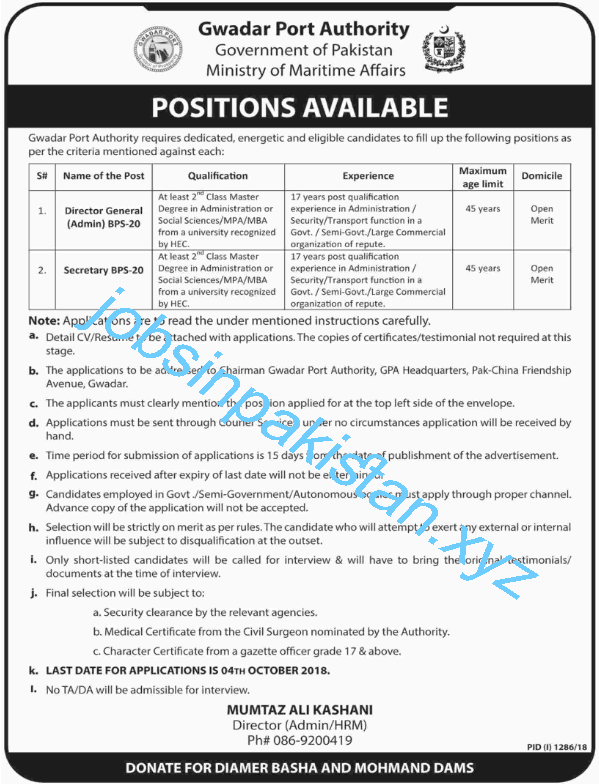 Gwadar Port Authority Jobs 2018 is listed below on our site. The advertisement for Gwadar Port Authority Jobs 2018 is come on today newspaper dawn. The last date for submitting of form for Gwadar Port Authority Jobs 2018 is 04 October 2018. If you want to apply for Jobs in Gwadar Port so, kindly send your detail C.V to Gwadar Port Authority Headquarters. Applications for Jobs in Gwadar Port must be send through courier otherwise applications cannot be accepted. Applications after 04 October 2018 cannot be accepted. Government and Semi Government employees can also apply for Gawadar Port Authority Jobs 2018. Selection for empty Jobs in Gwadar Port is very strictly. Only short listed candidates will call for interview in Gwadar Port Authority Headquarters. Gwadar Port Authority requires a applications for following empty jobs. Qualification: At least 2nd Class Master Degree in Administration or Social Sciences/MPA/MBA from a university recognized by Higher Education Commission.